Blood & Sand deserves it’s own Flog entry, as it was certainly the best meal I had while in St. Louis. It is a private, members only club, specializing in craft cocktails and food. Fortunately, they make exceptions for out of town travelers during certain hours (5-6:30pm) and luckily, that is the exact time of the dinner break during the tournament. Steve and I went with our friends Dr. Marc and Randall. I loved the space; I thought it was decorated beautifully, and much trendier and hipper than I was feeling. 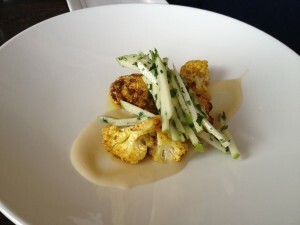 Steve and I shared a roasted curried cauliflower dish to start. I was worried that he wouldn’t like the flavors, but he seemed to really enjoy it. 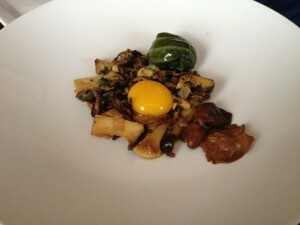 The deep roasted curry flavor was balanced by a julienne of tart green apple. Marc had a pureed watercress soup – he thought it was okay, but was not impressed by it. 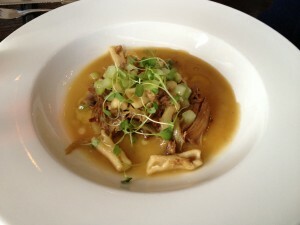 Next, we shared a simple dish of roasted local mushrooms. It was topped with an egg yolk, which made a silky sauce once broken. Again, the flavors really came through and I thought it was excellent. We had ordered the tagliatelle carbonara, however, one of the night’s specials, a braised lamb neck with homemade cavatelli came instead. Our server had misheard us and apologized, letting us know the carbonara would be out shortly and that we should enjoy the cavatelli as we waited. No apologies needed, Ma’am! We dug in and it was excellent. Before you get grossed out at the thought of lamb’s neck, you should know it was completely deboned and if I told you it was lamb shoulder or such you would have been perfectly content as well. In fact, when the carbonara arrived, we agreed that the cavatelli was superior. 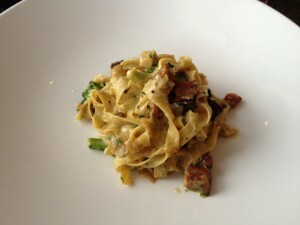 Not to say the carbonara wasn’t delicious as well, in fact, the bacon pieces in the carbonara were deeply smoked and satisfying. We had the fish of the day next. 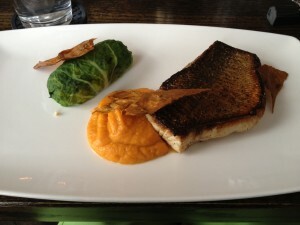 It was a grilled walleye with a smooth sweet potato puree. It was simple, but cooked to perfection and we enjoyed it immensely. 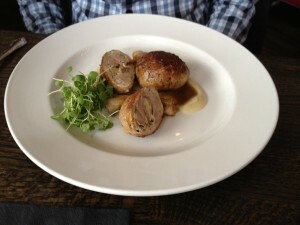 I tried a bite of Marc’s quail, stuffed with sweetbreads and I swooned. Quail can be overcooked very easily, but this was excellent. We were full, but clearly we needed to try dessert. We shared a chocolate mousse, which was rich, creamy and satisfying. 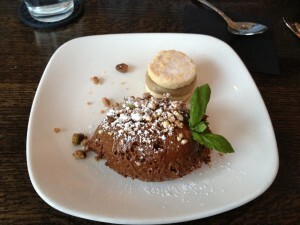 It came with a shortbread cookie sandwiched with hazelnut butter that was extremely salty. It was really the only flaw in my meal. The service was extremely attentive. Our server went over every entrée available, describing them in minute detail. We had varying options on this; Dr. Marc loved it and enjoyed the attention. I think it was overkill, as I can read the menu myself and ask questions, if needed. Since I still had another 26 hands of bridge to play, I didn’t have a cocktail, which is a shame, as that is their specialty. Steve appear to enjoy his wine. 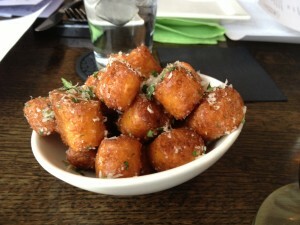 If I lived in St. Louis, it would be worth it to become a member, if only to drop in for a bowl of tator tots.